Images emerging from the Hubble space telescope have revealed a number of planetary nebulae and galaxies with complex and varied morphologies. While different mechanisms have been proposed to influence certain galactic forms, the mechanisms that drive the diverse morphologies are not yet well-understood. The goal of this Chapter is to apply the UG theory to large astronomical objects, such as nebulae and galaxies, and to demonstrate the viability of the theory by explaining how relatively simple SHP configurations can provide the mechanism which drives the creation and maintenance of a number of poorly understood galactic morphologies and properties, including the mechanism responsible for the creation and maintenance of the various types of spiral galaxies. The structure and dynamics of galaxies and nebulae can be analyzed using the equations developed in Chapter III. Specifically, equation 3-1-20 will be applied to a number of observed morphologies with the anticipation that the level of radiation emitted from a given section of a galaxy should be greater in areas of higher density. The maxima and minima of the radiation are thus expected to follow the respective patterns of the minima and maxima of the ordinary matter potential energy. Note that the observational resolution within galaxies and nebulae is of the order of ( is about ), which is far greater than The term is therefore indistinguishable from , and may be replaced by it. The general approach taken here is to modify the remaining parameters one or two at a time, and to review how morphology (and therefore morphological classification, such as the Hubble classification) changes continuously with variation of the individual parameters. We begin with the parameters and , followed by , and . In the following discussion it is assumed that while the rotational velocity of the given galaxy as a whole is fast enough to flatten the galactic plane into a rotating disk, the velocities of its SHP groups are still relatively low. For the provided examples, �slow� SHP group rotation implies that the velocity of the SHP group(s) is non-relativistic ( ) and that the distance traveled by the SHP group during the time it takes the gravitational signal to propagate from the SHP group to the orbiting object is negligible. Figure 4-1 presents a two dimensional map of the calculated potential energy of an ordinary particle of mass as a function of its location in the rotational disk plane of a simple hypothetical object containing a single stationary SHP of mass at its center. 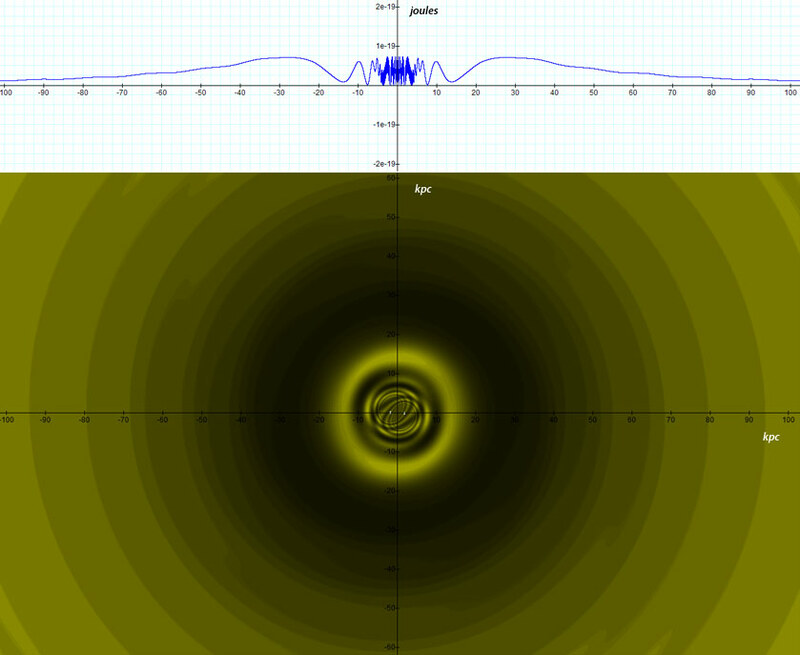 The figure was derived via equation 4-1-1a using the parameters , , , , , , and ). The potential energy is demonstrated via a color-coded map, where brighter color values indicate lower potential energy and darker colors represent higher potential energy levels. The upper curve provides the potential energy along the axis, and its minima and maxima thus correspond to the light and dark color values respectively along the axis. In order to create the two dimensional map, a set of energy threshold levels were selected, where is an integer ( and when ). 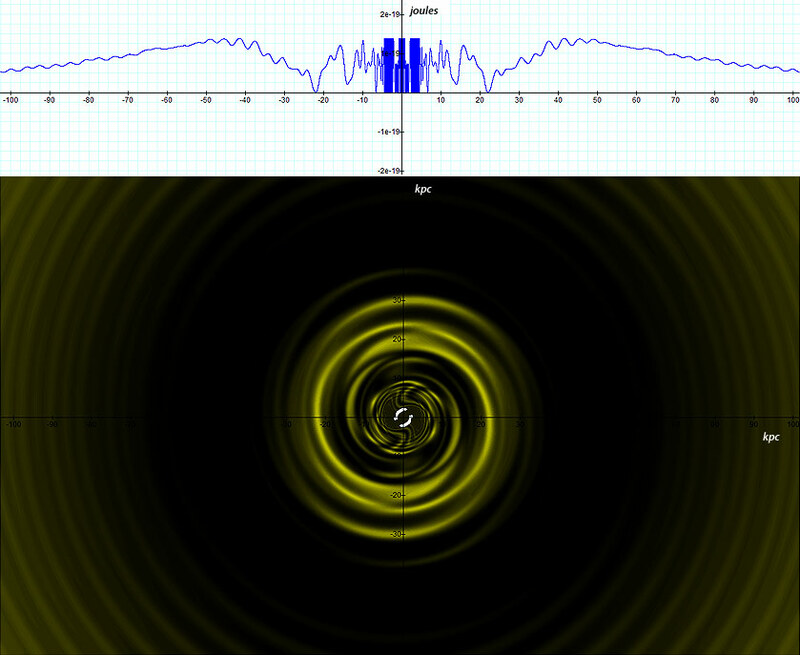 Each location on the rotating disk at at time was layered in yellow once for each value, where of equation 4-1-1a is greater than Therefore, an area where the potential energy is higher than the highest energy threshold is layered times and appears very dark. An area where the potential energy complies with is layered by a single layer of color and appears as light yellow. An area with a potential energy remains unlayered and consequently appears white. 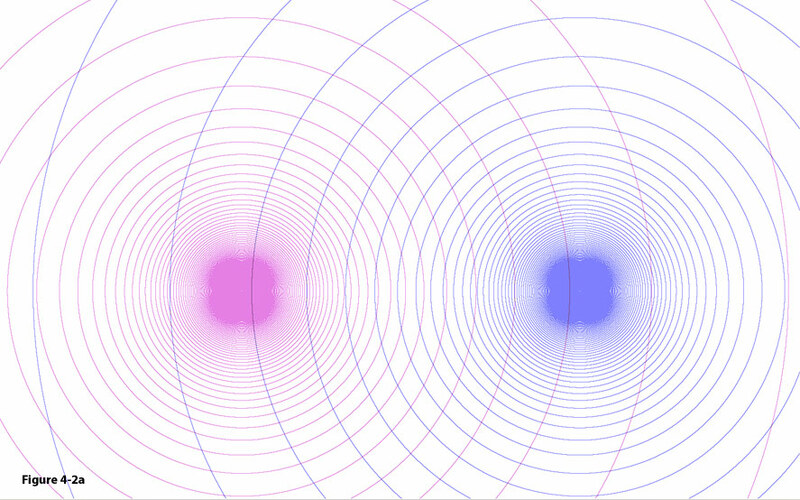 Figure 4-1: The lower image displays the two dimensional color map of the calculated potential energy of an ordinary particle of mass as a function of its location for the case of a single stationary SHP group located at and composed of a single SHP of mass The upper image provides the potential energy along the axis, and is displayed in order to identify the exact minima locations. A contour that is brighter than its immediate neighboring contours is at a local minimum of the potential energy, while a contour that is darker than its immediate neighboring contours is at a local maximum. Calculations were performed via equation 4-1-1a using the following values: , , , , , , , , . The pattern of the matter density of a galaxy centered around a single SHP group provides for the existence of rings, however does not account for the existence of stellar systems. Stellar systems can be explained with the introduction of the concept of multiple SHP groups. In the following section, star formation will be addressed in the special case of stationary or very slow rotating binary SHP groups. Figure 4-2a: The intersections of the minima contours of two SHP groups create local minima where clouds of gas are formed. The collapse of these clouds generates star formation. Figure 4-2b: Decreasing the distance between the SHP groups substantially increases the number of intersections (and thus the number of stars formed). Note the occasional occurrence of arcs, which resemble the appearance of filaments. Figure 4-2c: As the distance between the SHP groups reduces, further pattern changes can be noted in the geometrical pattern near the center of the galaxy. In addition, at large distances only contours of the same radius (or zonal index) can intersect. Figure 4-2d: At a very short distance , concentric contours are produced and the galaxy becomes almost indistinguishable from a galaxy containing a single stationary SHP group located at its center. In figure 4-2d, as the distance (and therefore ) increases, the two arcs approach each other to create a full circle, or a ring. In general, when the ratio between the orbital radius of the SHP group(s) and the distance of the object from the galaxy center , equation 4-1-1a results in a galaxy or nebula that demonstrates essentially the same form as provided by a single SHP group (see figure 4-1a), where the total number of superheavy particles in the group is given by the sum . As can be deduced from equation 4-1-1a and demonstrated by figures 4-2a to 4-2d, the number of intersections between the two sets of concentric minima circles increases as the distance between the two SHP groups is reduced, creating more star systems. 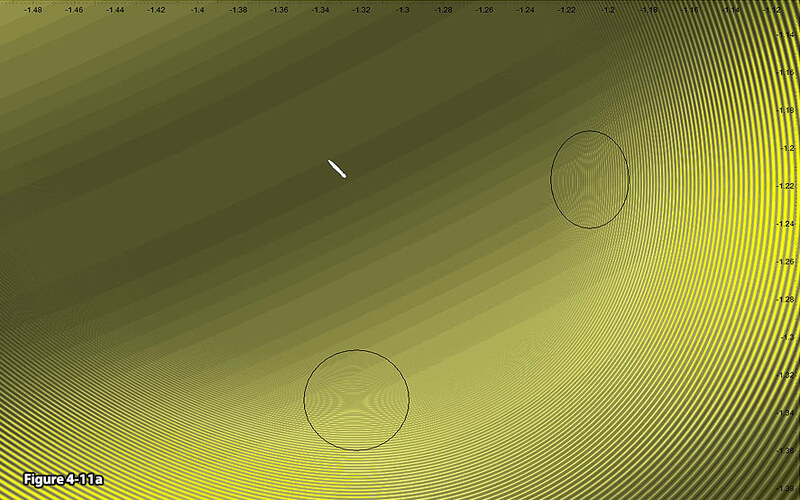 Figure 4-2e provides the two dimensional contour map of the overall potential energy pattern generated by two identical SHP groups positioned at , and . The number of minima (represented by the brightest areas) increases and their individual sizes reduce with decreasing distance from either SHP group. Consequently, stars created in the immediate areas surrounding the SHP groups are expected to be smaller and more abundant than those produced at more distant locations. As shown in the figure, some very large stars should be generated from the gas trapped at the minima, located for example at , , and . The size of the minima, and therefore the size of the stars produced within them, should decrease, and the number of stars should increase as their distance from the SHP groups is reduced. Note that the darkest areas within close proximity to the SHP groups (within a radius of about ) are not continuous and appear so due to the limited resolution of the figure. These areas actually consist of many distinct minima separated by maxima, where many thousands of small stars can be created. Note that some of the minima may be too small to cause a collapse. Figure 4-2e: A two dimensional contour map of the overall potential energy pattern generated by two identical SHP groups (positioned at , and , where the axis is perpendicular to the page). Star formation may occur at the isolated minima (displayed as bright circles or bright segments (or filaments). The size and the abundance of stars are determined by their distances from the two SHP groups. Note that the stars in the center or mid-region of the galaxy are significantly larger in size and smaller in number than those near the SHP groups. Further note the broad arcs produced at a great distance from the galaxy center. The sizes of the stars are therefore dependent on the distance parameter , which determines the closest point of intersection to either one of the SHP groups, and therefore the minimum size of stars produced within the galaxy.10 As the galaxy center is relatively far from both SHP groups (by as much as in this example), the stars produced at the intersection points close to the center are expected to be fewer in number and larger in size than those produced closer to either one of the SHP groups. This phenomenon was observed near the core of the Milky Way Galaxy (Courtland, 2008). Extending the discussion, equation 4-1-1a will be applied to map and evaluate a series of known morphologies that may have been generated by binary SHP groups. The resultant models will then be compared with morphologies observed in various galaxies and nebulae. Features such as multiple rings, arcs, spirals and ansae will also be considered and explained. Current theories suggest that some of these features may in part be determined by binary central stars, external interactions, stellar winds and magnetic fields in the case of planetary nebulae, or by the gravitational influence of companions or collisions in the case of galaxies; however the exact mechanisms which drive the diverse morphologies are not yet well-understood, and certainly not proven. We begin using the above scenario of binary SHP groups, each containing a single type of superheavy particle. The SHP groups may either remain stationary or may rotate around each other at relatively low velocity.12 In such a system, the morphology will be shown to be determined mainly by the value of the parameter , which is equal to the orbital radius of a single or binary SHP groups around the center of the core of the galaxy or nebula. Figure 4-3a provides the two dimensional map of a nebula generated by two stationary (or slow rotating) SHP groups separated by a distance of , where , , and the overall mass of ordinary matter in the cloud is about (using a single cut-off value of ). The resultant image appears as a butterfly structure composed of narrow arcs, bearing a close resemblance to the morphology of a number of axially symmetric, or �butterfly� nebulae (see NGC 6302 in figure 4-3b, NGC-2346 in figure 4-3c and the Boomerang Nebula in figure 4-3d).13 The width of the two outer lobes, or the �wings� of the butterfly formation, is determined by the value of . The span of the two wings increases as is reduced, becoming a full circle as . Reduction of the ordinary matter effect will strengthen the butterfly morphology. However, increasing by a factor larger than ten (in this example) may eliminate the butterfly pattern, instead creating a pattern of concentric spheres or circles. Note that for the case of a static or slow-rotating nebula, the nebular structure is not reduced to a thin rotating disk and retains substantial depth. Therefore, the minima arcs become spherical sub-sections that appear to overlap when viewed from our Solar System, obscuring the view of the arcs but not the general view of the butterfly wings. Figure 4-3a: Displays the two dimensional map of the potential energy minima contours of an ordinary particle of mass as a function of its location in the galaxy plane , calculated by applying equation 4-1-1a to a nebula with stationary or low velocity SHP groups separated by the distance from each other. The resulting morphology resembles the general structure of the Bug Nebula NGC-6302, the Butterfly Nebula NGC-2346 and the Boomerang nebula shown in figures 4-3b, 4-3c and 4-3d respectively. Figure 4-3b: An image of NGC 6302, or the Bug Nebula, taken by the refurbished Hubble Space Telescope, shows a celestial object that looks like a delicate butterfly. The image, provided by NASA, was released Wednesday, Sept. 9, 2009 (AP Photo/NASA);http://nasa-satellites.blogspot.com/2009/09/excellent-images-from-refurbished.html. Figure 4-3c: NGC 2346, the Butterfly Nebula, courtesy of Massimo Stiaelli (STScl) and NASA; http://www.nasaimages.org/luna/servlet/detail/NVA2~4~4~7989~108515:NGC-2346--A-Butterfly-Shaped-Planet. Figure 4-3d: A Hubble space telescope image of the Boomerang Nebula provided by NASA; http://www.spacetelescope.org/images/html/heic0301a.html. The same methodology can be applied toward producing the hourglass structure observed in MyCn 18 (figure 4-4e), or at the center of the Southern Crab Nebula (figure 4-4b). Such structure requires at least two superheavy particle groups. The highly symmetrical structure of the hourglass morphology suggests the existence of two dominant groups of equal SHP mass. The value of is more difficult to estimate, however the selection of is a reasonable starting point. Equation 4-1-1b can be divided by without bearing any effect on the overall morphology, as the potential energy minima will remain at the exact same locations as long as is also divided by . Therefore, can be selected. Since was shown to produce concentric spheres or circles, a larger distance should be tested. Initially, we can arbitrarily select values of and and then apply the first scaling theorem of the UG theory for correction.14 Comparing the two dimensional maps generated by different values of with the desired morphology provides a relatively good fit at . The resultant map in figure 4-4a demonstrates a close resemblance to the central section of the Southern Crab Nebula in the constellation of Centaurus. Plotting the concentric equi-potential minima contours of the two SHP groups provides vivid insight into how such a pattern is formed at the intersections of the various minima contours. Note that finding the right value of is not difficult since the general hourglass structure appears within a wide range of values, and can easily be fined-tuned via trial and error to generate the desired - proportions. Using the above parameters results in a galactic-scale radius of , which is about 111,000 times larger than the desired dimensions of a nebula of roughly . With the aid of the first scaling theorem of the UG theory, the transformation of , and will provide the exact same morphology in the typical scale of planetary nebulae.15 MyCn 18 (figure 4-4e), known as the Engraved Hourglass nebula, provides a similar bipolar morphology, but differs in two important aspects: First, the dramatic, bright central core observed at the center of the Hourglass nebula does not appear in the calculated model of figure 4-4a. In addition, the two sets of concentric circles are observed to overlap significantly, rather than simply intersecting at a single point at the center (as is the case in figures 4-4a and 4-4b). The results obtained by applying the scaled-down parameters and using a potential energy cut-off of and adding into the equation the contribution of ordinary matter of at the center of the nebula are presented in figure 4-4c. The resultant object is of the size of a typical nebula, and retains its general morphology beyond the central area of the structure. The addition of a large mass of ordinary matter at the center of the galaxy produces a strong gravitational pull inward towards the center. The gravitational pull is especially robust at low radii, resulting in the formation of a circular bulge at the galactic core, where the size of the central bulge increases with the amount of ordinary matter near the center of the galaxy. Figure 4-4a: Demonstrates an hourglass morphology generated by two stationary single-particle SHP groups of SHP mass , where the SHP velocity , and the distance between the SHP groups and center of rotation is approximately . The calculated pattern bears a close resemblance to the center of the Southern Crab Nebula, displayed in figure 4-4b. Also shown are the two identical sets of concentric minima contours produced by group 1 (green) and group 2 (cyan), which are displaced by a distance of The overall potential energy minima are given by the intersections between the two sets of minima contours respectively generated by each of the two SHP groups, and are indicated in blue. Note that the calculated morphology depicts an additional set of arcs along the galaxy�s axis of symmetry (the axis) that were not detected in the observed images (these two additional calculated arcs provide spiral arms in cases of rapidly rotating SHP groups). To resolve the lack of overlap between the two sets of contours generated by the two SHP groups in the modeled galaxy (relative to the observed image of MyCn 18), a greater distance value can be used. Figure 4-4d demonstrates that the relatively large overlapping area between the two sets of circular contours in MyCn 18 may be generated by introducing a much larger distance . Application of this value, using , , , and provides two sets of concentric overlapping contours, as well as a central accumulation of matter, resulting in an almost identical morphology to the Hourglass nebula. Figure 4-4b: The Southern Crab Nebula, image credit: Romano Corradi Instituto de Astrofisica de Canarias, Tenerife, Spain, Mario Livio, Space Telescope Science Institute, Baltimore, MD, Ulisse Munari, Osservatorio Astronomico Di Padova-Asiago, Italy, Hugo Schwarz Nordic Optical Telescope Canarias Spain, and NASA. Figure 4-4c: Scaling down by a factor of about and adding the contribution of of ordinary matter at the center of the structure provides the dimensions of a typical nebula, and an internal central bulge similar to the center of the hourglass nebula shown in figure 4-4e. Figure 4-4d: Demonstrates a calculated hourglass morphology generated by two stationary single-particle SHP groups of SHP mass , where the SHP velocity , the distance between the SHP groups and their common center of mass , and the overall mass of ordinary matter . The calculated pattern bears a significant resemblance to the center of the Hourglass nebula MyCn 18displayed in figure 4-4e. Figure 4-4e: The Hourglass Nebula, MyCn 18. Image credit: R. Sahai and J. Trauger, Photo AURA/STScl/NASA/JPL (NASA photo # STScl-PRC96-07); http://apod.nasa.gov/apod/ap020615.html. Figure 4-5a: Displays a two dimensional map of the potential energy contours of an ordinary particle of mass as function of its location in the galactic disk for a galaxy similar to the one used in figure 4-4a, using a superheavy particle of mass . The black contours include the lowest minima regions, where , while the yellow contours provide the range where Ordinary matter is expected to concentrate at the minima contours (mainly at the black contours, and to a lesser degree at the yellow contours), resulting in a ring morphology. Also displayed are the circular minima contours of the potential energy contribution of each of the two SHP groups (in green and cyan). Note the resemblance to the planetary nebula Abell 39 in figure 4-5c and to Hoag�s object in figure 4-5b. The following parameters were used: , , , and . Figure 4-5b: Image credit: NASA and the Hubble Heritage Team (STScI/AURA) Acknowledgment: R. Lucas(STScI/AURA) http://www.nasaimages.org/luna/servlet/detail/NVA2~4~4~4753~105279:Hoag-s-Object--A-Strange-Ring-Galaxy. Figure 4-5a depicts a similar galaxy of SHP mass and orbital radius , viewed in a substantially increased display threshold using two cut-off energy levels and to show only the vicinity of the minima (where darker color values indicate lower potential energy). The resultant morphology transforms into a ring structure, bearing a resemblance to a number of galactic systems with external rings, such as Hoag�s Object in figure 4-5b (Hoag, 1950), as well as NGC 6028 (Vorontsov-Velyaminov, 1959), NGC 2859 (Sandage, 1961), UGC 9562 and NGC 3081. The model may be scaled down to the dimensions of a typical nebula (via the first scaling theorem of the UG theory given in Appendix A) to explain the structure of ring nebulae such as Abell 39 in figure 4-5c. The morphology of galaxies can be sorted into four main categories according to the Hubble Classification System, dividing regular galaxies into three broad classes- elliptical, spiral and lenticular galaxies, as well as a fourth class of galaxies with an irregular appearance.16 The Hubble sequence shows significant variation even within its broad morphological classes, and the transitions between them are relatively smooth. Thus, classification provides only an approximate procedure, where two skilled astronomers may arrive at two different classifications for the same galaxy. Among the morphological classes, spiral galaxies have proven to be particularly intriguing and challenging, as understanding their evolution andthe variation among their local properties has shown to be one of the more complex undertakings in astrophysics. Drawing on earlier work by Bertil Lindblad, C.C. Lin and Frank Shu suggested that the spiral pattern can be viewed as a manifestation of low-amplitude �density waves� that rotate throughout the galaxy with fixed angular speed called pattern speed, causing a periodic compression and rarefaction of the disk surface (Lin & Shu,1964). As the compression wave rotates, it triggers star formation on the leading edge of the spiral arms. Lin and Shu also assumed that in the large-scale spiral structure, the appearance of spiral arms remains stable over many orbital periods.17 At present, near-infrared images of nearby galaxies have provided convincing evidence that the large-scale spiral structure is a density wave. However, emerging theories suggest that the spiral pattern is far from stationary, and that spiral structure may result from a wide variety of causes. The study of the dynamics of differentially rotating disks has since developed into an extensive density wave theory. The theory has achieved relative success in explaining how spiral patterns can persist for a greater length of time than the particular arms we see at a given moment, leading to a semi-empirical approach for modeling different spiral morphologies. Other theories suggest that the formation and evolution of spirals, as well as a broad range of galactic morphologies, can be explained via gravitational encounters or collisions between galaxies. Nevertheless, in their book Galactic Dynamics, James Binney and Scott Tremaine stated �The number of reviews of spiral-structure theory is disappointingly small� (Binney & Tremaine, 2008). While observations provide persuasive evidence of the existence of density waves, the exact nature of the density wave is not yet well-understood and the number of galaxies successfully modeled (quantitatively) is small. By means of the UG theory, spiral morphology can be generated by the interaction between a test object and two (or more) SHP groups rotating at non-relativistic speeds of , or by a single (or more than one) SHP group rotating at a relativistic speed. According to equation 4-1-1a, the size and morphology of a galaxy depends on the mass of its dominant superheavy particles, the rotational velocity of the SHP groups, and their radii of orbit around the center of the galaxy. The mass of superheavy particles in equation 4-1-1a affects the potential energy amplitude through the term , and the size of the galactic disk through the term . Note that the SHP contribution to the object�s potential energy increases its potential energy amplitude by a factor of . Therefore, the rotational velocity of the SHP groups increases the effective size of the galaxy by a factor between (in the direction perpendicular to the direction of the velocity of the SHP group) and (in the direction parallel to the direction of the SHP velocity).18 The farthest substantial zonal minimum from the center is located at in the relativistic case (which is reduced to in the non-relativistic case). The farthest substantial minimum provides the distance of the last significant outer contour (or isophote) containing a high density of matter,19 and therefore defines the visible edge of the galaxy, or the galactic disk radius. In figures 4-1 to 4-5, the morphology appears to be far more sensitive to the radius of the SHP group(s) than to changes in the number of SHPs within the SHP group(s), or to changes in the SHP mass (at least for the case of a single dominant SHP). Recall that as a cloud of gas collapses inward under its own gravitational force to form a galaxy, the law of conservation of angular momentum dictates that its rotation must accelerate as it becomes more and more compressed. According to the UG postulates, the extreme conditions generated by the collapse lead to the creation of massive superheavy particles. As of equation 3-3-1, the velocity of SHP groups is proportional to their radius of orbit, and may therefore be relativistic. In the case of two stationary or very slow rotating binary SHP groups, an hourglass pattern similar to the observed nebula MyCn 18, or to the center of the Southern Crab nebula, can be generated at distances not much larger than the order of . As the distance between the SHP group and the object increases well beyond , the morphology begins to change into a butterfly pattern, and eventually forms a concentric ring structure at , where the distance separating two successive rings increases with their distance from the SHP groups. The rotation of SHP groups will be shown to result in the formation of spiral structures. The mechanism responsible for the creation of spirals at low velocities differs from the mechanism responsible for the creation of spirals at relativistic velocities. At low rotational speeds, a minimum of two SHP groups are necessary in order to create a spiral structure. In the relativistic case, however, due to the effect of relativistic distance contraction in the direction parallel to the direction of the SHP velocity, and to the lack of relativistic contraction in the perpendicular directions, even a single SHP group may be sufficient to produce spiral morphology. We begin with the non-relativistic case. 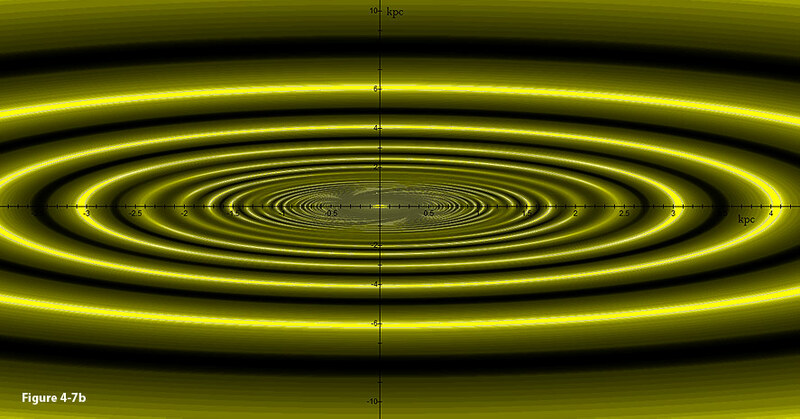 Figure 4-6 displays a two dimensional map of the potential energy minima contours of an object composed of a single ordinary test particle of mass as a function of its location within the galactic disk plane. The provided galaxy contains two SHP groups of SHP mass traveling at a velocity of at a radius of , where and . The minima contours of the overall potential energy were again calculated via equation 4-1-1a, and the display provides the regions where the test particle�s potential energy complies with . The particle�s potential energy minima, indicated in black, are shown to be located at the intersections of the minima contours of the two SHP groups, indicated in cyan and green respectively. The figure demonstrates a clear spiral structure at the central part of the galaxy. The spiral arms are constructed from arcs, which appear relatively short near the galaxy center and grow longer as the test particle�s distance from the center increases. The mechanism at work to produce the spiral structure at non-relativistic velocities requires at least two SHP groups, where each group generates a set of concentric minima around itself. Equation 4-1-1a provides minima at the coordinates at which the two cosine terms are either equal to or very close to . At these locations a circular minimum contour produced by a single SHP group (in cyan) coincides with a circular minimum contour produced by the other SHP group, forming a set of arcs at and near their intersection points. As the distance between the minimum intersections and the central SHP groups increases, a greater amount of time is required for the gravitational signal traveling at a relativistic velocity to arrive. This lengthens the distance traveled by the two SHP groups between the time(s) that the gravitational signals (or gravitons) were emitted, as well as the time of their simultaneous interception by the orbiting object. Consequently, the arcs that are farther away from the galaxy center will lag behind those closer to the center, in effect creating a spiral pattern. Figure 4-6: Depicts the contours that fulfill equation 4-1-1a, where both SHP groups rotate at a non-relativistic speed of A clear spiral structure appears at the central part of the galaxy, created at the intersection points of the two sets of concentric circular contours generated by the two rotating SHP groups. The complete mathematical formulation leading to the spiral is given by equations 4-1-1a, 3-1-17a, 3-1-17b and 3-1-20. The following explanation, while making some approximations, can make these mathematical results somewhat more intuitive. Following equation 2-1-12, the radii of a set of potential energy minima generated by a stationary SHP group can be approximated by (for , , �). A second factor affecting the minima locations is the displacement of the SHPs during the finite time it takes the gravitational signal to reach the orbiting ordinary particle. This results in different sections of spacetime being affected by the gravitational pull created by the SHP groups at different times and different locations. For the case where the speed of SHP groups is small relative to the speed of light, or , the difference in the amount of time it takes the gravitational signal to propagate between the two successive minima contours indexed and is , in which time the two SHP groups were displaced by the angle of . Therefore, as long as and , the effect of the SHP group rotation is negligible, and a standard hourglass morphology will result. When becomes more substantial, but still significantly smaller than (for example, ), the small angular displacement between the successive minima contours creates a clear spiral structure. At larger distances of , where is very small compared with , the pattern displays both ring and spiral morphology. At distances where , the pattern becomes a ring galaxy (as long as the relative influence of the galaxy�s ordinary matter is sufficiently small). Therefore, a galaxy (of non-relativistic SHP velocities) may contain at least one outer ring, as well as an inner spiral structure located between the central core and the outer ring. Such morphology may occur when and , and is observed in M31 the Andromeda galaxy. However, the relative effect of the galaxy�s ordinary matter may be sufficiently large to eliminate the outer rings. The results of substituting the values , , , and into equation 4-1-1a are depicted in figure 4-7a, providing a structure that bears a resemblance to a smoothed version of the Andromeda galaxy. The modeled galaxy, viewed in face-on orientation, displays a central hourglass structure (which appears slightly distorted by the rotation of the central SHP groups) and a series of rings, where the most prominent outer rings (bright minima of , and ) are located at about , and , as well as a more diffused inner structure. A tilted version of the computed galaxy is displayed in figure 4-7b. The model also depicts two trailing spiral arms in between the central bulge and the ring at (see the enlarged view in figure 4-7g). These features of the modeled galaxy fit well with the properties demonstrated by the Andromeda galaxy in figures 4-7c and 4-7f, which depict two tightly wound trailing spiral arms that extend outward and transition into a ring galaxy between and . The rotating hourglass structure at the center of the modeled galaxy (figure 4-7g) also bears a resemblance to the general structure of Andromeda�s nucleus (figure 4-7f), additionally accounting for the ansae reported by Beaton et al. in 2007 (Beaton et al., 2007). Note that the model predicts the existence of virtually an infinite number of ansae, which may be perceived as a single ansa on each side when viewed in insufficient resolution. Figure 4-7a: Substituting , , , and into equation 4-1-1a provides a face-on view of a series of rings, where the most prominent outer rings (bright minima of , and ) are located at about , and , as well as a central hourglass structure that is slightly distorted by the rotation of the central SHP groups. The resultant structure bears a significant resemblance to a smoothed version of the Andromeda galaxy (see figure 4-7c). Note that the lowest few energy contours were displayed in black to increase the contrast between the central disk and the surrounding environment. Figure 4-7b: Display of the same modeled galaxy tilted at nearly around the axis. Note that this simple model does not take into account the influence of Andromeda�s companion galaxy M32 on its morphology. A companion galaxy will be shown to explain distortions in the ring or spiral structures of galaxies such as Andromeda, as well as the appearance of �beads on a string.� The influence of a companion galaxy on galactic systems will be demonstrated in section IV-4. Figure 4-7c: An infrared view taken by NASA�s Spitzer Space Telescope revealed a dust ring deep within the Andromeda galaxy. Combined with previous data of an outer ring, the image was interpreted as evidence that the neighboring dwarf galaxy M32 collided with the Andromeda Galaxy about 210 million years ago, plunging through its central disk. According to the UG theory, Andromeda�s rings are a direct consequence of equation 4-1-1a, while the appearance of �beads on a string� and the split of the outer rings are due to the gravitational effect of a companion galaxy (see section IV-5). Image credit: NASA/JPL-Caltech/K. Gordon (University of Arizona, http://www.spitzer.caltech.edu/Media/releases/ssc2005-20/ssc2005-20a.shtml. Figure 4-7d: Provides a direct comparison between the calculated galaxy of figures 4-7b and the observed image in figure 4-7c. Figure 4-7e: Provides the tilted version of the calculated image of the center of the Andromeda galaxy. Note the ansae and two spiral arms displayed at the central bulge and the similarities between the calculated image in figure 4-7e and the observed center of Andromeda in figure 4-7f. Figure 4-7f: A view of the center of figure 4-7c. Figure 4-7g:Provides a clear view of the calculated central disk of the modeled galaxy. Note the appearance of ansae, as well as two short tightly wound trailing spiral arms extend outward and transition into a ring galaxy between and . The lowest few energy contours are depicted in black to increase the display contrast between the central disk and the surrounding environment. 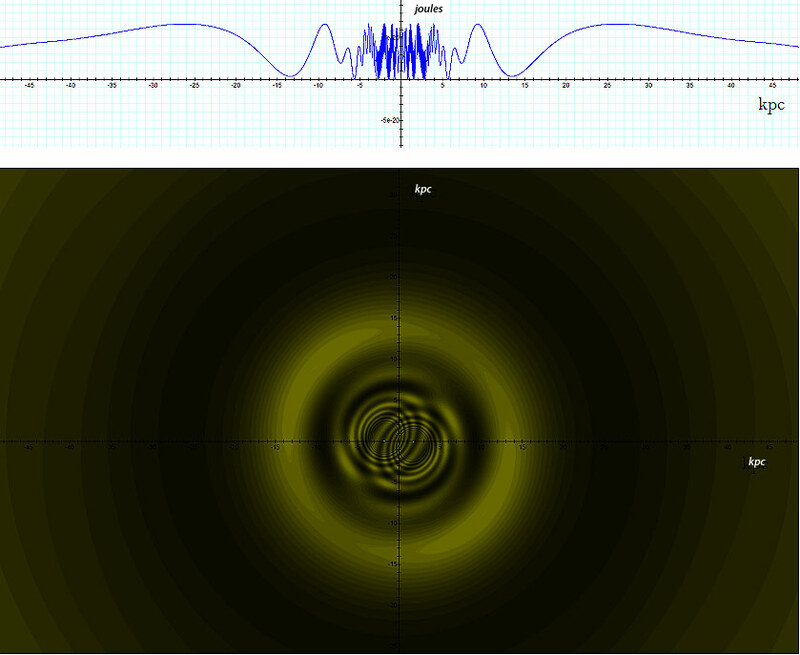 Figure 4-8a: The lower image provides the two dimensional color map of the calculated potential energy of an ordinary particle of mass as a function of its location , substituting , , , , , . The upper curve provides the potential energy along the axis. The resultant minima contours resemble slightly distorted elliptical (almost circular) isophotes of various sizes and orientations. These contours change smoothly in accordance with the distance of the ordinary particle from the galaxy center, creating rings and arcs at the minima (the brightest contours) and relative voids at the maxima (at the darkest contours) as well as a slightly distorted hourglass pattern at the center of the galaxy. Figure 4-8b: Displays a galaxy generated using the same parameters as figure 4-8a, where is increased to . Note that a decreased display resolution is used. Note that the isophote patterns in figures 4-8a and 4-8b are still approximately circular and do not yet provide a spiral structure. However, when the SHP velocity is increased to , as shown in Figure 4-8d, the potential energy of the galactic disk begins to form into a spiral structure with two trailing arms, and the hourglass morphology at the center of the galaxy begins to shift into a bar-like structure. It is generally quite difficult to determine simply by observation whether a spiral arm is leading or trailing. However, in almost all cases where the result is unambiguous, the spiral arms are found to be trailing. This can be expected according to the UG explanation. The underlying reason for the formation of the spiral morphology is that it takes longer for the gravitational signal to reach the farthest sections of the spiral arms than to the sections located closer to the galaxy center. The farthest sections of the spiral are thus influenced by earlier locations of the SHP groups, and therefore lag behind their counterparts at the inner portion of the same spiral. Consequently, the outer edge of a spiral arm should be trailing, while the inner edge should be leading.21 Increasing the velocity of the SHP group to and strengthens the spiral structure. 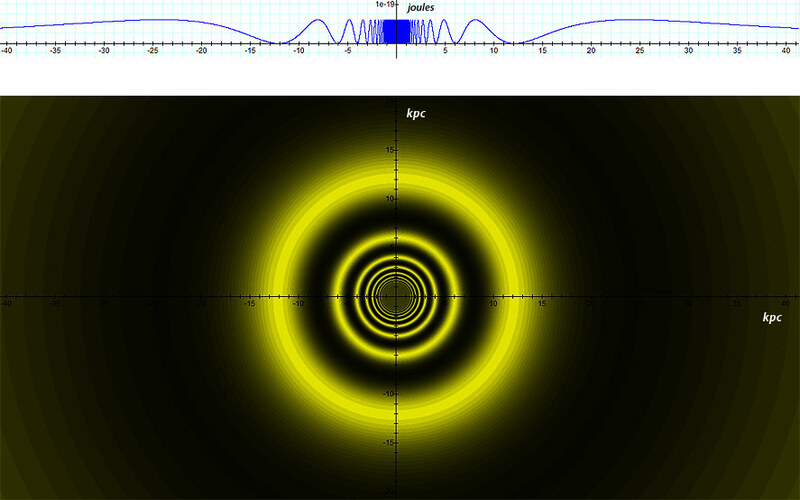 As displayed in figures 4-8e and 4-8g, the spiral becomes tighter, further defining the central bar. Figure 4-8c: Depicts a galaxy generated via the same parameters as figure 4-8b with only a single superheavy particle , producing clear asymmetry. Figure 4-8d: When the velocity of the SHP group is increased to (using the same parameters of , , , , , and ), the potential energy at the galactic disk begins to form into a spiral structure with two trailing arms, and the central hourglass morphology begins to shift into a bar structure. Figure 4-8e: Setting the parameters and , the calculated model bears a close resemblance to the morphology of the galaxy M81. Figure 4-8f: provides a composite of M81 from NASA�s Spitzer and Hubble space telescopes and NASA�s Galaxy Evolution. Image credits: NASA�s Spitzer and Hubble space telescopes and NASA�s Galaxy Evolution (NASA/JPL-Caltech/ESA /Harvard-Smithsonian CfA); http://www.nasa.gov/mission_pages/spitzer/multimedia/spitzer-20070604.html. Note the similarity between the calculated pattern displayed tilted in figure 4-8e and the image of the galaxy M81 shown in figure 4-8f after modifying and . The dark section between approximately in figure 4-8g provides the external maximum at . The galaxy�s visible border is located at its minimum contour at approximately , and the area enclosed within this radius thus constitutes the galactic disk. A focused view of the central part of is provided in figure 4-8h, demonstrating a spiral morphology with two external trailing arms as well as an internal spiral that consists of both trailing and leading arms. While the trailing spirals are located at the outer end of the visible spiral arms, the leading spirals are located at the inner end of the spiral arms.22 Note that this model bears a close resemblance to the galaxy NGC-4622 depicted in figure 4-8i. Figure 4-8g: Increasing the speed of the SHP groups to further strengthens the spiral structure and demonstrates both leading and trailing spiral arms, providing a morphology that resembles the galaxy NGC 4622. However, there is a clear difference between the modeled galaxy and the observed NGC 4622 galaxy. While the modeled galaxy provides a strong bar at its center, NGC 4622 demonstrates an unbarred or oval structure. Accounting for the additional influence of ordinary matter of mass of at the core of the modeled galaxy results in a non-barred spiral morphology, shown in figure 4-8j. Therefore, the principal factor that determines whether or not a spiral galaxy is barred or oval is likely to be the relative amount of ordinary matter at its central core, or the ratio . Figures 4-8h and 4-8i: Comparison of the calculated galaxy to NGC-4622 using , , , , , , , and . Credit for Figure 4-8i:G. Byrd, R. Buta, (Univ.Alabama, Tuscaloosa), T. Freeman (Bevill State College), NASA; http://apod.nasa.gov/apod/ap040221.html. Figures 4-8j and 4-8i: Same comparison as displayed in figure 4-8h and 4-8i, however the amount of ordinary matter in the central disk at is set to . The central bar structure of figure 4-8f is replaced by an oval bulge. As the velocity of the SHP groups increases to in figure 4-9a, the arms of the modeled galaxy become more tightly wound and segmented in appearance, bearing a resemblance to flocculent structures, as observed in the galaxy NGC 488. To attain a better fit, the rotation of the two SHP groups was reversed relative to the previous modeled galaxies to a clockwise rotation (by using rather than ), and the total mass of ordinary matter at the central core of the galaxy was increased to . Figure 4-9b: NGC 488, image credit: Johan Knapen and Nik Szymanek, Isaac Newton group of telescopes. http://www.ing.iac.es/PR/science/ngc488.html. Lenticular galaxies are regarded as transitional objects between elliptical and spiral galaxies. Similar to spiral galaxies they contain a rapidly rotating disk and a central bulge, and similar to elliptical galaxies they are often smooth and featureless, contain little or no cool gas, and have minimal or no star formation. As the transition between the various morphological classifications is generally smooth, it is likely that more than one type of morphology can fall under the broad definition of lenticular galaxies. Figure 4-10a provides an example of a calculated lenticular morphology. Similar parameters to those used to model NGC 4622 in figure 4-8h were applied,25 however the mass of ordinary matter at the center of the galaxy was increased to . Subsequently, the central bulge expanded to cover all of the minima contours up to the zonal minimum indexed (therefore, the central bulge almost extends throughout the entire rotating galactic disk). The resultant morphology resembles the lenticular galaxy NGC 2787, displayed in figure 4-10b. Figures 4-10a and 4-10b: Comparison between a UG calculated galaxy (with face-on orientation) and the lenticular galaxy NGC 2787, using the following parameters for the calculation: , , , , and . Image credit for figure 4-10b: Marcella Carollo (ETHZ), Hubble Heritage, NASA; http://apod.nasa.gov/apod/ap020408.html. An interesting finding is made when zooming the display around one of the SHP groups to about 100pc, as shown in figure 4-11a. The figure depicts several concentric crisscrossing isophotes, which emerge in patterns that bear a striking resemblance to MCW 922, the Red Square Nebula, and to the Red Rectangle provided by figures 4-11b and 4-11c respectively. In 2007 Peter Tuthill and James Lloyd reported the Red Square nebula to consist of a box-shaped X structure which necks down into identical opposing hyperbolic bicones, a series of orthogonal linear rungs, and a series of radial linear features resembling a comb that lie along the bicone surfaces (between the rung and the outer edge of the nebula). They additionally noted that the structures are, to a remarkable extent, reflection symmetric about the principle axis (Tuthill & Lloyd, 2007). All of these features appear in the marked sections of figure 4-11a. According to Tuthill and Lloyd, �The finding of a cousin to the Red Rectangle, but with differing spectrum and a hotter central star, implies that the conditions of formation for these elegant bipolar ladders may not be so singular and unique as formerly thought.� Indeed, the fact that several (at least four) such structures were found in this single model figure, and that they are very similar in general appearance yet somewhat differ in particular features, suggests that there may be many such structures even within a single galaxy. Figure 4-11a: Provides a high resolution image of the same galaxy modeled in figure 4-8h, using , , , , , and . The display is zoomed to about around one of the SHP groups. The circled areas bear a striking resemblance to MCW 922, the Red Square Nebula, and to the Red Rectangle shown in figures 4-11b and 4-11c respectively (note that aside from the two circled patterns, there are few more similar unmarked patterns). Note that for the purpose of clarity, the color scheme is reversed, where the darker color values indicate lower potential energy. Figure 4-11b:MWC 922: The Red Square Nebula credit(Tuthill & Lloyd, 2007); http://apod.nasa.gov/apod/ap070416.html. Figure 4-11c: The Red Rectangle, Image credit: H. Van Winckel (KULeuven), M. Cohen (UC Berkely), H. Bond (STScI), T. Gull (GSFC), ESA, NASA; http://www.nasaimages.org/luna/servlet/detail/NVA2~4~4~5326~105852: Rungs-of-the-Red-Rectangle. Figure 4-12a provides the calculated potential energy of an ordinary particle of mass within the plane of a galaxy with one companion. The parameters of the main galaxy are given by , , , , and , and the parameters of the companion galaxy are given by , , , , , and (figure 4-12a). The general structure of the calculated morphology bears a resemblance to the cartwheel galaxy shown by the Hubble Space Telescope (HST) image (figure 4-12b). The two galaxies on the left side of the image are companion galaxies. A similar pattern of �beads on a string� was spotted in Andromeda and number of other galaxies with nearby companion. A comparable pattern is also apparent in figure 4-13, displaying the effect of a companion on supernova 1987A. Figure 4-12b: Observed Cartwheel Galaxy ESO 350-40, image credit: NASA, ESA, and K. Borne (STScI)http://hubblesite.org/gallery/album/pr2007017d. Figure 4-13: Supernova 1987A, image credit: NASA, ESA, P. Challis and R. Krishner (Harvard-Smithsonian Center of Astrophysics); http://www.nasa.gov/multimedia/imagegallery/image feature 773.html. In the above examples, a simple model based on as little as four or five independent parameters ( , , (or ), and (for the case of binary SHP groups)) of a single galaxy composed of a single or binary SHP groups and ordinary matter was demonstrated to account for a variety of galactic and nebular morphologies. However, as real physical systems are likely to contain multiple types of superheavy particles and multiple SHP groups, the UG model may be extended to cover more complex cases. To start, a galaxy may contain multiple SHP groups rotating around the central core at different velocities and at various orbital radii. However, following the logic provided in section III-3, the orbits of the SHP groups are nearly circular and their rotational velocities are determined uniquely by their radii via equation 3-3-1, where . Therefore, any additional SHP group requires the addition of three or four independent variables ( , , and ). Following the third section of chapter III, all of the SHP groups with orbital radii shorter than their zonal oscillation range with ordinary matter must comply with , and must rotate together as a rigid body, in unison with the central core of the galaxy. A model of multiple SHP groups will be applied in the following chapter for a UG analysis of Saturn�s ring system. The UG model can be further extended by allowing some SHP orbits to deviate from the rotational plane of the galaxy. Substantial deviation, for instance a deviation of , may explain the structure of polar ring galaxies while a lesser amount of deviation may explain the structure of ESO 510-G13, displayed in Figure 4-14. Figure 4-14: An edge-on view of the galaxy ESO 510-G13, image credit: NASA, the Hubble Heritage Team, and C. Conselice;http://heritage.stsci.edu/2001/23/caption.html. 1 At , this simplifying assumption can replace the more restrictive assumption of a homogeneous distribution of ordinary matter within the galaxy or nebula. 2 For clarification, while the energy of the object is modified by these transformations, the galaxy morphology, which is driven by the location of the minima, is unaffected by the reduction of and to . However, the amount of galactic radiation will decrease (see theorem A-2 in Appendix A). 3 Note that the energy required for the creation of superheavy particles is assumed to be generated by the vast amount of energy released during the collapse of a cloud of gas composed of ordinary matter toward its center. In the process of collapse, the moment of inertia of the collapsing gas cloud is reduced by a large factor, or . As the total angular momentum of the cloud needs to be preserved, or , even a very small initial angular velocity will be accelerated to high angular velocity . Therefore, the angular velocity of the galaxy�s central core and its SHPs should become elevated immediately after the collapse. However, over time the galaxy�s angular momentum may be reduced substantially by a number of mechanisms, such as galactic wind or collisions between galaxies, resulting in a gradual slowing of the rotation of the galactic core and its superheavy particles. 4Recall that at distances , the exponent , and that the maxima and the minima of equation 4-1-1a occur when both and are equal to or respectively. Using the assumed values of , , , , and (and therefore ), the resultant potential energy is given as at the maxima, and as virtually zero energy at the minima. Further note that the overall color value at the center of this hypothetical galaxy is relatively dark. This is due to the arbitrary and unrealistic assumption that the galaxy contains only SHPs and no ordinary matter ( ). In a more realistic model, where is substantially large, the center appears brighter than the surrounding galaxy (see figures 4-4d, 4-8e, 4-9a and 4-10a). 5 Note that according to equation 4-1-1a, the radii of the minima circles are dependent on the SHP mass and are independent of the number of superheavy particles in each SHP group. 6 This is correct since typically and are greater than or of the order of , while . Therefore, . In addition, the influence of ordinary matter is assumed to be negligible at this point of the discussion. 7A more detailed explanation of how stars are formed and the influence of rotation on the process will be discussed later on in chapter VI. A similar mechanism on larger scale can create entire galaxies (within clusters), which in turn generates a large population of stars. Thus, the panoramic view of the night sky consists of galaxies and stars. 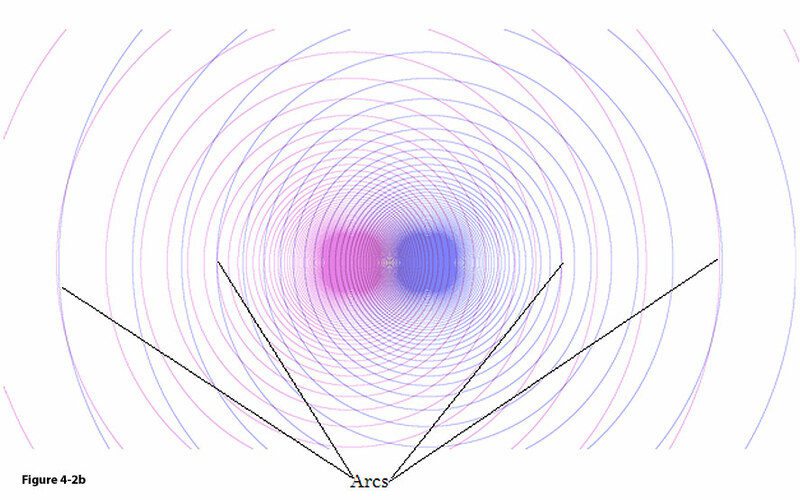 8 When the two intersecting points are sufficiently close, two nearby star systems are likely to form. If the two stars are sufficiently massive, the gravitational interaction between them may become stronger than their interaction with the galaxy center, and they may consequently begin to orbit around each other as well as around the galaxy center. This can explain the occurrence of binary star systems, as well as their low abundance relative to the number of single star systems. This may further be applied within the Solar System to provide a possible explanation for how the Earth and Moon system was created. 9 This is true as long as the assumption that the two groups consist of superheavy particles of equal mass holds true. 10In the example provided in the figure, the closest intersection to the SHP groups is at a distance of about to from one group, and about from the other. 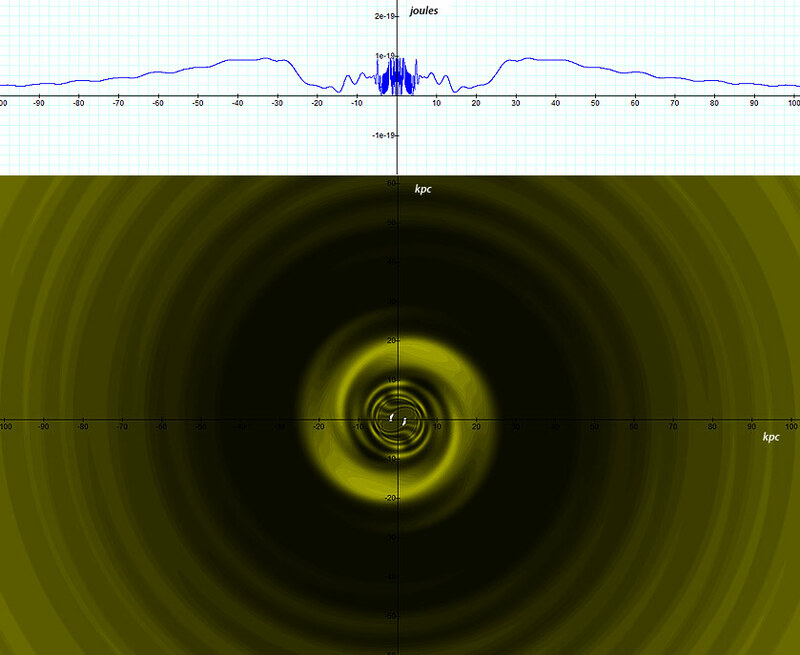 It is possible to estimate the minimum star size by either zooming the display around the minimum point to a sufficient display resolution, or by applying equation 2-1-12 to calculate the indices of the contours generated by each SHP group and equation 2-1-16 to calculate their estimated widths. 12 In the Newtonian scenario, the SHP groups must rotate around each other, or otherwise collapse into each other. Thus, the scenario of no rotational velocity is unstable. According to the UG theory, this is not necessarily the case for two massive superheavy particles, since two SHPs can be kept apart by the rejection zones (or maxima) created by their interaction. 13 Nebulae of this type are currently believed to have been formed by the outflow of gas from a massive central star and to be relatively short-lived phenomena, lasting only a few tens of thousands of years. According to unified gravitation, the structure of a nebula is determined by the mass of its core of ordinary matter and by the size, quantity and orbit of its SHP groups. Therefore, as long as the above parameters are not subject to significant change, nebular morphology is a long-lasting phenomenon. 14The first scaling theorem is discussed in Appendix A. 15In this example, and , and do not need to be taken into account. 16 Additional classes and sub-classes have been added over time, for example Arp�s peculiar class, which includes a class of ring galaxies. 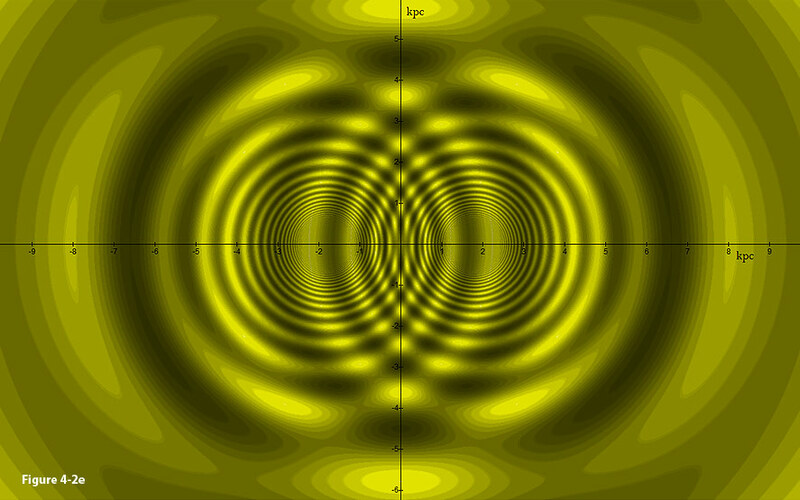 17 Alternatively, Lin and Shu assumed that the spiral pattern is a long lasting stationary density wave. 18 The dependency of the size of the galaxy in the direction parallel to the direction of the velocity of a superheavy particle group can be proportional to , due to the contribution of in the denominator of the cosine operand, and the fact that can be reduced by a factor of in the parallel direction. 19 The radius of the most external minimum actually resides at a farther distance, at approximately . However, at this distance the UG equation becomes almost indistinguishable from the Newtonian equation, and since the total mass of the superheavy particles is significantly smaller than the total mass of ordinary matter in the galaxy, the minimum contour at would not be noticeable. Instead, a minimum contour occurs somewhere between the maximum contour and the minimum contour at the point where the rate of change of the ordinary matter contribution to the potential energy of the object is equal in magnitude, but opposite in sign to the rate of change of the galaxy�s SHP contribution. As this minimum occurs at greater distance from the galaxy�s main body, where the UG equation becomes almost indistinguishable from the Newtonian equation, and as the contribution of the galaxy�s ordinary matter to the potential energy of the object is also substantially reduced at the given distance, the visual effect of this additional minimum contour is relatively small. 20 Some stars may form due to interactions of the single dominant SHP group and lesser SHP groups (smaller in size or quantity), or due to gravitational interactions with companion galaxies or nebulae. 21 Further explanation is provided in Chapter VI. 22 It will be demonstrated that in the case of rapid SHP rotational velocities, the visible galactic arms are actually part of a larger trailing spiral structure that begins at the central nucleus and continues far beyond the galactic disk. However, only some sections of the spiral have sufficiently low potential energy and a high enough density of matter to emit substantial radiation. The perceived morphology therefore displays shorter segments of spirals with leading inner and trailing outer edges. 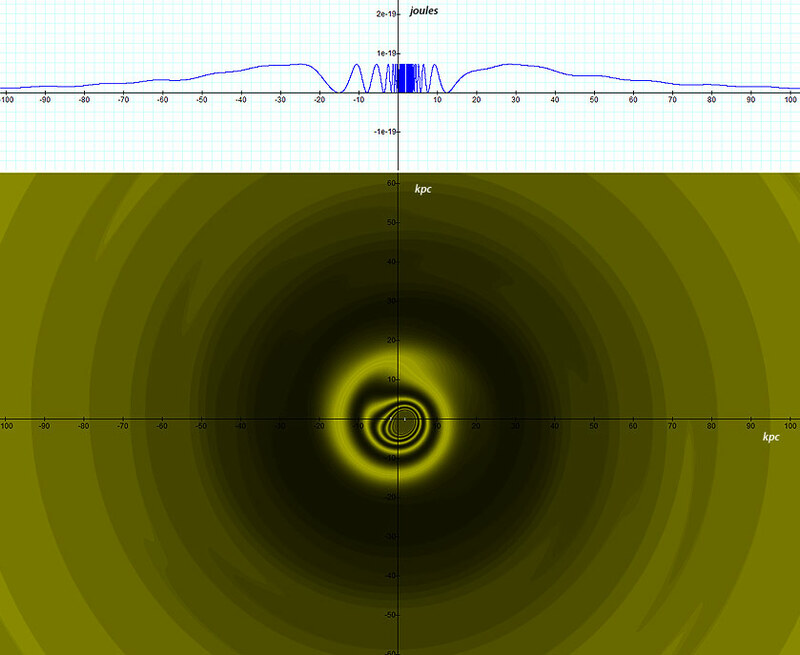 23 Note that the two white arcs at the central bulge are simply a calculation artifact, which occurs at extremely high potential energies where calculated numbers exceed the numeric range of the computer/graphical program. In such cases the pixel remains white. However, even those artifacts can provide useful information as they indicate the general areas where the SHP groups are located. 24 Note that the image was calculated in a face-on orientation, and then tilted around the axis and around the axis, both counter-clockwise. 25 The following parameters were used: , , , , and .